As you might have read in past posts, I recently started a Little Weirdos Instagram account. Much to the disapproval of my bank account, it has become yet another outlet for me finding cool toys I want to buy. See the beauties in the first photo above for exhibit A, which I saw posted by user monsterisland. 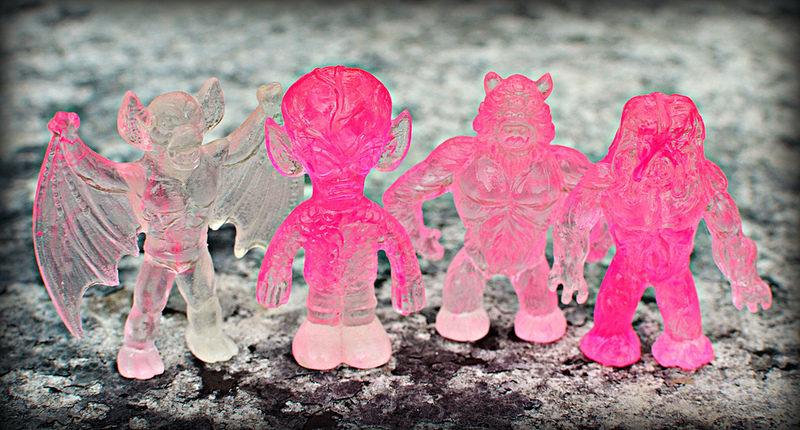 They are new versions of the classic Diener Space Creatures (the original figures shown in the second photo), made in clear pink/glow swirl resin. How cool is that? I don't get into a lot of resin stuff, but this new take on the freaky Diener dudes was way too great to pass up. And not only do they look awesome in the light, they glow REALLY strongly in the dark. MonsterIsland also created and sold these, through the store at monsterisland.bigcartel.com. The bag of four creatures cost $15, which I thought was incredibly reasonable as custom toys go. The site currently says sold out, but who knows--maybe they'll make a reappearance. At least there will be different figures in the same style to come, as the store teases "next up aliens and space ships." Might have to buy these if they become available again. Been looking for some Deiner Space Creatures anyway, never found any. These new customs are gorgeous. Looks like the latest ones they've done are blue/glow swirl. As of writing this comment they still appear to be available in their store.